I've had this set of pillow for over a year now. I was looking for pillows that were like the ones in some of the hotels I've stayed in. At first these were pretty close. They are not real full but they are very moldable for support where you need it. I have purchased so many pillows in the past two years it's quite crazy. They were all either too firm, or too soft, or too small, or too big. They were hot to sleep on or rough, just seemed liked I kept throwing good money after bad......until I bought these pillows. Honestly these are the most comfortable pillows I have ever slept on in my ENTIRE life )55) years! They are soft and doughy, but supportive.They are cool, comfortable and everything I could ever hope to have in a pillow. I have been sleeping with them for several days now and they just seem to be becoming better and better. I don't want to get out of bed! No more stiff neck! No more headaches! I am so happy with these pillows and if you need or want a GREAT pillow you need to buy these NOW! I recommend these EVERYONE!! Best pillow on the market! I HAVE BEEN BUYING PILLOWS FOR YEARS, CANNOT TELL YOU HOW MANY BRANDS I HAVE TRIED AND THE MONEY SPENT, FROM THE CHEAPIEST TO THE HIGHER PICED, ALL FAILED AND WENT FLAT VERY QUICKLY. THESE PILLOWS ARE THE BEST! I HAVE TWO STUFFED WITH OUR SHAMS AND TWO TO SLEEP ON. THEY ARE HEAVY AND PERFECT, WE HAVE A QUEEN BED, BUT PURCHASED THE KING TO GO ALL THE WAY ACROSS THE BED. YOU WONT BE ROLLING AROUNF WITH THSES ALL NIGHT AND THE PRICE IS GREAT! BEST PILLOWS OUT THERE! These are not cheap pillows! These are nice quality pillows! Soft, fluffy, feel like feather pillows. They fill the pillow cases out nicely, the pillow case does not ride off the actual pillow. We have a king size bed that also sleeps 4 dogs. These four dogs also think that pillows are for them as well to lay on. With that said we have gone through so many pillows because over time they would get flat pretty quickly. These pillows fluff back up pretty nice. Even if a dog had been laying on them all day just a quick shake and they are fluffy again. Side note: Since they are Gel Fiber they are nice a cool to sleep on. You don't fill all sweaty and nasty. We also don't feel the need to wash them weekly but still do. I would highly recommend these pillows to anyone looking for something new! I purchased a set of 4 for two different rooms, and I was very pleased. Buyers should be warned that they are extremely soft and have a lot of give, so if you're looking for a firmer pillow, these are not for you. However, if you're like me and love the sensation of sinking into the pillows when you lie down, then these are the pillows for you. Fantastic pillows. I ordered the firm pillows. Some pillows can be warm to me at night but these pillows seem to keep me cool through the night. Product seems very well made with great quality. I would say it's like using a luxury pillow from a nice hotel. I would definitely recommend to a friend or family member. These are the best pillows if you like soft luxury..My husband and I are so happy with them..they are super soft and comfy. 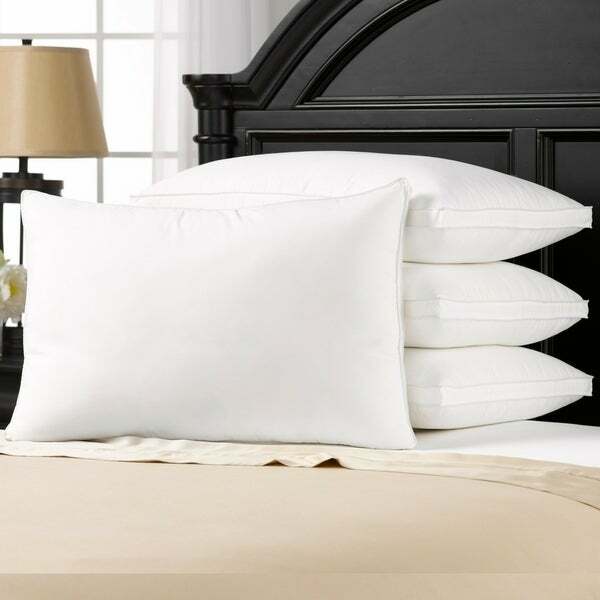 These pillows are well made and very comfortable; I get a restful night's sleep every night! I love these pillows. They are so comfy and nice and soft. If you like firm pillows these are not for you. I was skeptical about buying pillows without feeling them but we are so happy with them. I am buying another set. My husband loves these pillows whereas I like them. I'm smaller than he is, so when I use them under my head, it causes neck strain. As a result, I am using my pillow for hanging a leg over while sleeping on my side. I have to use another type of pillow under my head. Large, plush, pillows. Exactly what we wanted. Very nice and soft pillow set. They are comfortable and fluff up night nicely. I did fluff them and let the sit on a table to 24 hours prior to using them the first time. I am going to order another set for the guest room. Love how these came vacuumed sealed. Per the instructions, once opened I fluffed and let sit for 24 hours. So far so good. I purchased the firm as I am a side sleeper and these are a good size and have some heft to it. Will update my review after I've had a chance to really sleep on these an see how well they hold up. Soft, but sturdy material. Easy to put on your kinh suze pillows, and to remove for washing! Love these so much !have 4 and will be buying more for the future.